ROSEMONT, Ill. (May 3, 2018) — Skin cancer is the most common cancer in the United States. It is estimated that one in five Americans will develop skin cancer in their lifetime, and one person dies from melanoma, the deadliest form of skin cancer, every hour. 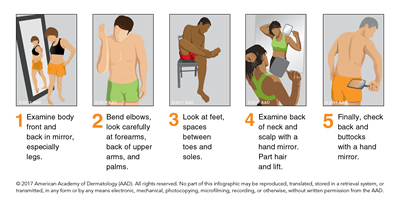 In recognition of Skin Cancer Awareness Month in May and Melanoma Monday® on May 7, the American Academy of Dermatology is encouraging the public to be a “Skin Cancer Hero” by learning how to detect skin cancer early, when it’s most treatable. The campaign aims to save lives by teaching the public how to identify the warning signs of melanoma, perform a skin self-exam and find free SPOTme® skin cancer screenings in their area. A is for Asymmetry: One half of the spot is unlike the other half. B is for Border: The spot has an irregular, scalloped or poorly defined border. C is for Color: The spot has varying colors from one area to the next, such as shades of tan, brown or black, or areas of white, red or blue. D is for Diameter: While melanomas are usually greater than 6 millimeters — or about the size of a pencil eraser — when diagnosed, they can be smaller. E is for Evolving: The spot looks different from the rest or is changing in size, shape or color. Even if you don’t have any other symptoms, see a board-certified dermatologist if you notice one of these signs or notice an existing mole start to evolve or change in any way. Examine your entire body — front and back — using a full-length mirror. Then, look at your right and left sides with your arms raised. Bend your elbows and look carefully at your forearms, underarms and palms. Look at the backs of your legs and feet, the spaces between your toes, and the soles of your feet. Check your fingernails and toenails; however make sure to remove any nail polish first. Examine the back of your neck and scalp with a hand mirror. Part your hair for a closer look. Finally, check your back and buttocks with a hand mirror. Consider asking a partner to help, as another set of eyes can be helpful for checking the back and other hard-to-see areas. A video on “How to Check Your Skin for Skin Cancer” — part of the AAD’s Video of the Month series, which offers tips people can use to properly care for their skin, hair and nails at home. A new AAD PSA, “Caught It,” which encourages men over 50 to be aware of changes on their skin so that they can detect skin cancer early, when it’s most treatable. A “How to Be a Skin Cancer Hero” infographic containing tips on how to spot the signs of skin cancer on yourself and your partner. How to find a free SPOTme® skin cancer screening in your area; more than 400 screenings are available nationwide in May. SPOT Skin Cancer™ is the AAD’s campaign to create a world without skin cancer through public awareness, community outreach programs and services, and advocacy that promote the prevention, detection and care of skin cancer. The AAD designates the first Monday in May as Melanoma Monday® in order to raise awareness of melanoma and encourage early detection through skin self-exams. The public can help raise awareness of melanoma and other types of skin cancer by using the hashtag #skincancerhero when sharing AAD resources on social media, and by encouraging friends and family members to take advantage of the AAD’s free skin cancer screenings. Individuals who have been affected by skin cancer can share their personal stories on SpotSkinCancer.org to provide support and inspiration for others fighting skin cancer, and communicate the importance of skin cancer prevention and early detection.